12 Mr.Shinde.N.B. 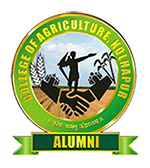 10/268 In partial fulfillment of the requirements for the degree of master Science agriculture 2012 Dr.D.S.Patil Soil Science and .Agri No 2) Prof.Mohiite A.B..
14 Mr.Thorat.S.D. Sep-26 Integrated weed management in upland Rice (triticum qestivum L.) 2011 Dr.N.Y.Patil Agronomy No. 2) Prof.Shewale.M.R . 15 Mr.Korde.S.D. 10/029 Response of sunflower (Helianthus qnnuys.L) Hybrids to different sowing deltes in summer conditions. 2012 Dr.Pisal.A.A. Agronomy Yes 2) Prof.Shewale.M.R . Under summer conditions. 3) Prof.Shewale.M.R . Studies on effect of spent mushroom compost on growth parameter cabbage (Brassica oleracepvar capital L) 1) Dr.Sawashe.S.G. 30 Miss. Randhavan.S.S. 10/236 2012 Dr. G.G.Khot Microbiology No 2) Dr.Patil.D.S. 31 Mr. Shinde.I.Y 10/239 Effect of dualation of Am fungi 2012 Prof. D.P.Deshmukh Microbiology No 2) Dr.Patil.D.S. 32 Mr. Patil.P.D. 10/235 Effect of Glyconacetobacter diazotrophicus 2012 Dr.S.G.Sawashe Microbiology No 2) Dr.Sawashe.S.G. Host plant resistance and management of sugarcane woolly Aphid (zehntner) 1) Dr.K.K.Mangave. 38 Mr. Gadade S. S. 10/185 Efficacy of chitin synthesis inhibitors Against tobacco Eating Caterpiller, Spodopter lityra (fabricius) (Noctuidge Lepidoptera) 2012 Dr. P. B. Mohite Entomology No 1) Dr. Sawashe S. G.
2) Dr. Khot G. G.
3) Dr. Patil S. A. 39 Mr. Chandankar V. P. 09/120 Interaction studies of Bioa gent and wbirte grub management of Leucopholis lepidophora Bl (scarabaeidae) coleopteran) 2011 Dr. N. G. Patil Entomology No 1) Dr. Kharbade S. B. 2) Dr. Jadhav Y. R.
3) Dr. Shinde S. R.
40 Miss. Patil V. N. 11/109 Yield of upland paddy as influenced by leels of bagasse Ash and Rice-Husk Ash in inceptisol 2013 Dr. R. B. Pawar Soil Science & Agril Chemistry No 1) Dr. Pharande A. L.
2) Dr. Mohite A. B. 3) Dr. Kulkarni R. V.
4) Prof. Shewale M. R.
41 Miss. Lagad D. S. 11/111 Forms of phosphorus and phosphorus supplying capacity of Representative soil series of sub Montanez one of Maharashtra 2013 Dr. B. S. Kadam Soil Science & Agril Chemistry No 1) Dr. Pharande A. L.
2) Dr. Patil D. S.
3) Dr. Shewale M. R.
42 Miss. Shind S. R. 11/115 Evaluation of critical limits of potassium in soil & plant for Upland Paddy Grown on Shrink Swell 2013 Dr. D. S. Patil Soil Science & Agril Chemistry No 1) Dr. Pharande A. L.
2) Prof. Jagtap S. M.
3) Prof. Shewale M. R.
43 Mr. Sakore G. D. 11/113 Evaluation of critical limits of potassium in soil & plant for kharif Brinjal Grown on shrink Swell Soils 2013 Dr. R. V. kulkarni Soil Science & Agril Chemistry No 1) Dr. Pharande A. L.
3) Dr. Pawar R. B. 44 Mr. Koli V. H. 10/102 Economic Analysis of production & marketing of Raisins in western Maharashtra 2013 Prof. B. B. Gawade Economics Yes 1) Dr. Suryawanshi R. R.
2) Prof. Ratnaparkhe A. N.
3) Dr. Mangave K. K.
45 Mr. Shinde S. P. 10/260 Characterization & classification of Underground Irrigation water (In summer season) of Karveer Tahsil. Dist.- Kolhapur. 2014 Prof. Jagtap S. M. Soil Science & Agril Chemistry Yes 1) Dr. Pharande A. L.
3) Prof. Mohite A. B. 46 Mr. Shelake S. A. 10/267 Potassium Behavior in important soil series of Kolhapur Dist. 2013 Dr. Pharande A. L. Soil Science & Agril Chemistry 1) Dr. Patil D. S.
47 Miss. Kurakula Sunitha 10/189 Efficacy of New Molecules of insecticides Against the Diamond back Moth (Plutella xylostella c.) 2012 Dr. Mohite P. B. Agricultural Entomology 1) Dr. Mangave K. K.
Infesting cabbage. 2) Dr. khot G. G.
3) Prof. Patil S. A. 48 Miss. K,rumana Begum 10/188 Efficacy of newer insect cides against sucking pest. Complex in okra (Abelmoschus eseulentus L Moench) 2012 Prof. Patil. S. A. Agricultural Entomology 1) Dr. Mohite P. B. 2) Dr. Mangave K. K.
3) Dr. Bhosale. A. S.
49 Mr. Deshmuka R. R. Oct-27 Integrated weed Management in Soybean (Glycine Max L.) 2013 Prof. Pilane M. S. Agronomy 1) Dr. Shinde S. R.
50 Mr. Chate P. T. 10/234 Effect of Liauid Azotobacter and PSB on Growth and yield of chilli 2013 Dr. Sawashe S. G. Agricultural Microbiology 1) Dr. Khot G. G.
3) Dr. Patil V. S.
4) Dr. Mangave K. K.
51 Ms. Kokate D. S. 11/205 Empowerment of woman through self Help Groups 2013 Prof. Kolgane B. T. Agricultural Extension 1) Dr. Sasane G. K.
2) Dr. Suryawanshi R. R.
3) Dr. Jagdale U. D.
52 Mr. Anuse M. Y. 10/128 Jaggery processing technology followed by the farmers 2013 Prof. Kolgane.B. T. Agricultural Extension Yes 1) Dr. Sasane G. K.
3) Prof. Chaugule. G. B. 53 Miss. Kharat R. N. Nov-64 Genetic diversity studies in finger Millet (Eleusine corqcana gaerth.) 2013 Prof. Shinde S. R. Agricultural Botany Yes 1) Dr. Kamble M. S.
54 Miss. Pathan R. S. Nov-65 Generation Mean Analysis in Chickpea 2013 Dr. Shinde S. R. Agril. Genetics and Plant Breeding Yes 1) Dr. Kamble M. S.
56 Mr. Bhawar N. B. 11/169 Bioefficacy of new Insecticide molecules against sugarcane early shoot borer chilo in fuseatellus (shellen) Pyralidge :- lipid optero) 2014 Dr. Mohite P.B. Agril. Entomology Yes 1) Prof. Patil S. A. 2) Prof. Karade V. M.
3) Dr. Gedam V. B. 57 Mr. Lokare S. G. 11/172 Fled bioefficacy of certain newr insecticides against pest complex of brinjal solanum melongena (Linn) 2014 Dr. Patil N. G. Agril. Entomology No 1) Dr. Mohite P. B. 2) Dr. Patil V. S.
3) Dr. Jadhav Y. R.
58 Miss. Supekar S. R. 12/170 Studies on utilization of entomopatho genic Nematodes against white grab hort. Serrata fab. Infesting sugarcane 2014 Dr. Mohite Agril. Entomology No 1) Dr. Sawashe S. G.
2) Prof. Mohite A. B. 3) Prof. Patil. S. A. 59 Mr. Gore R. S. 12/167 Bioefficacy of new Insecticide Molecules against Okra past complex 2014 Dr. Patil N. G. Agril. Entomology No 1) Dr. Mohite P. B. 60 Mr. Patil K. B. 12/110 GPS-GIS Based fertility of panhala tehsil of Kolhapur District (M.S.) 2014 Prof. Jagtap S. M. Soil Science (Chemistry) Yes 1) Dr. Kadam B. S.
3) Prof. Shesale M. R.
61 Miss. Thombare P. C. 12/108 GPS-GOS Based Soil fertility map of Hatkanagale tahsil of Kolhapur District (M.S.) 2014 Dr. Kulkarni R. V. Soil Science (Chemistry) Yes 1) Dr. Patil D. S.
2) Dr. Pawar R. B. 62 Miss. Kale A. R. 12/106 GPS-GOS Based Soil fertility map of Karveer tahsil of Kolhapur District (M.S.) 2014 Dr. Pharande A. L. Soil Science (Chemistry) Yes 1) Dr. Kulkarni R. V.
2) Dr. Patil. D. S.
63 Miss. Surabhi H. K. 12/109 GPS-GOS Based Soil fertility map of shirol tahsil of Kolhapur District (M.S.) 2014 Dr. Pharande A. L. Soil Science (Chemistry) Yes 1) Dr. Patil. D. S.
2) Prof. Shewale M. R.
64 Miss. Jadhav R. D. GPS-GOS Based Soil fertility map of Kagal tahsil of Kolhapur District (M.S.) 2014 Dr. Patil D. S. Soil Science (Chemistry) Yes 1) Dr. Pawar R. B. 115 Mr .Sarnaik Devanand Govindrao 13/305 A study on good recaring management practice followed by good keppars in kop.district 2015 Dr.K.V.Gurav Agri.Extension Yes 1) Dr.U.D.Jagadale 2)Dr. M.K.Kamble 3) Prof .M.R.Shewale.